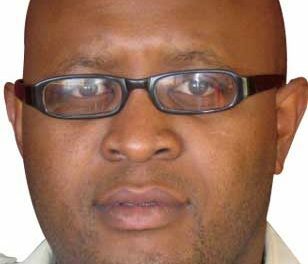 The Chief Executive Officer at the Namibia Trade Forum, Ndiitah Nghipondoka-Robiati, and Deputy Permanent Secretary at the Ministry of Industrialisation, Trade and SME Development, Dr Michael Humavindu, will participate in a visit to Germany on European Industrial and Economic Policies from 18 to 24 November and is part of the Visitors’ Programme of Germany. The two will also be joined by other experts from Southern Africa and they will have the opportunity to explore the various facets of European industrial and economic policy and consider them in the African context. German Ambassador Christian Schlaga presented both with their letter of invitation a forthnight ago in Windhoek. today (11 September). According to a statement, the programme includes visits to different Federal Ministries, the Federation of German Industries, the Association of German Chambers of Commerce and Industry and the German Parliament in Berlin as well as visits to the German-African Business Association of German Industry and the German Institute of Global and Area Studies in Hamburg. 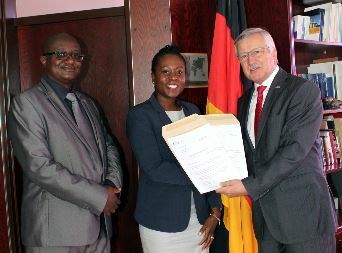 Caption: Christian Schlaga (German Embassy), Ndiitah Nghipondoka-Robiati and Dr.Michael Humavindu.